This team’s goals for 2015 are largely of the less quantifiable variety. Strong needs to develop the young players, find a QB, build an identity on offense, keep recruiting momentum going in-state, improve special teams, and see this team build on what little was accomplished last year. It’s conceivable that all of those things could happen and Texas might still only be 6-7 thanks to the combination of youth and a difficult schedule that is front-loaded with strong opponents. However, a season with seven or eight wins would probably indicate that Strong had a successful season in terms of checking off the important goals for the 2015 campaign while fewer wins could indicate at least a struggle to establish an offense or identity if not a failure. Because we know who’s on the schedule and a fair amount about what they are returning and likely to feature in 2015, we know what Texas needs to be able to do in order to beat six or more of the teams they’ll be facing. Spring camp is when the team is looking to nail down fundamentals and basics of the system, fall camp is when the coaches work out who the war horses are on the team and how to build around them for the coming season. So today we’re going to highlight some important schemes and players that Texas is going to need to see rise up in order to beat opponents in the fall. With John Harris and Jaxon Shipley moving on and the main threat of the Texas offense coming from Johnathan Gray’s legs, the Longhorns can expect to face loaded boxes from opponents trying to outnumber the run until they prove they can make defenses pay for this approach. 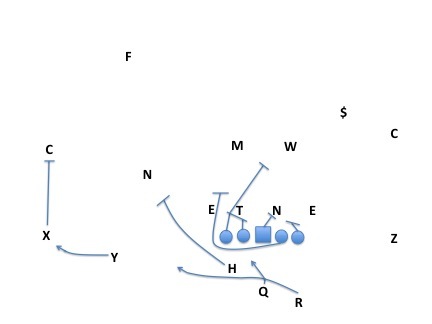 The Big 12’s favorite way to handle a good spread running game is to drop the boundary safety in a cover 4 scheme and attack the edges, forcing the offense to play in a narrow space. By doing this, they can make the zone read play a non-starter by always having an extra defender (the safety or nickel) waiting for the QB, and ready to make a tackle before he can even get going. Even if the Texas OL improves and Gray has all his wiggle back, it’ll be hard to consistently move the chains running the ball against that approach, particularly against teams with good support safeties. 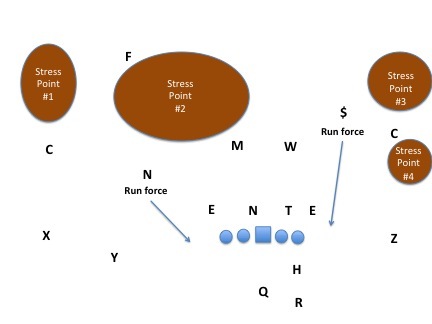 Defenses typically prefer to defer stress to their field corner and trust him to play good coverage in space on the outside receiver aided by the long distance the ball has to travel from the QBs hand before it can reach the target. 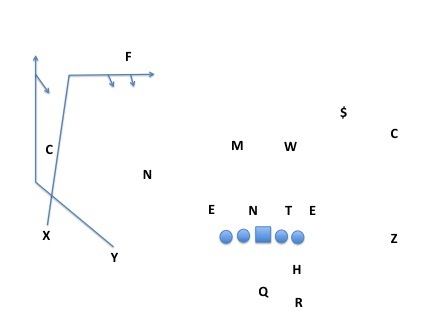 Texas has a variety of different ways to attack this stress point, the most effective method in 2014 was the “switch” combination of a dig route from the outside receiver and wheel route from the slot. The ample spacing and available route adjustments for the WR make it pretty easy to create passing windows, the tricky part is hitting them. 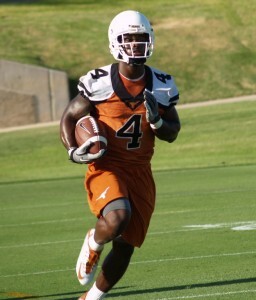 Swoopes has the arm strength to make this happen but this isn’t really in Heard’s wheelhouse. Some alternative ways to attack that space are with a deep post, which also requires some zip, or with a fade route. 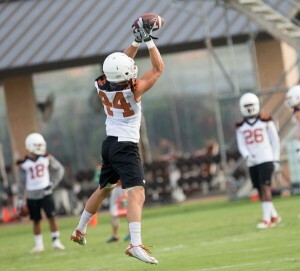 Another question here is whether Texas has WRs that can win deep against the corner on deep routes. Heard hit this seam route to Daje Johnson vs coverage by John Bonney in the spring game. This kind of scheme works best when the run game is effective at sucking in 2nd level defenders and when the slot receiver is excellent at making sharp breaks into open grass. Now you understand why Marcus Johnson is getting reps in the slot. Stress point #3 can really only be attacked if Texas can threaten stress point #4. When Charlie talks about needing receivers that can take a 5-yard hitch and turn it into a 60-yard gain, he’s talking about attacking corners in these schemes that don’t have deep help and will often give the WR a cushion to work with while counting on being able to bring them down before they do any damage. 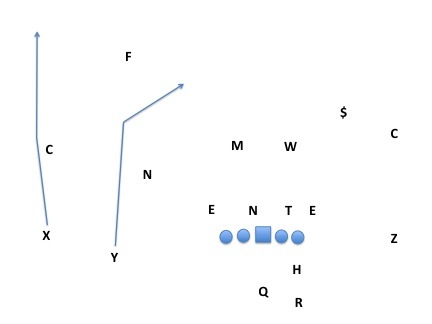 However, the space that the defense will give the boundary receiver on the sideline depends on how much of a threat he is to beat the corner deep. If he can’t coverage deep, then the corner is going to sit on the short routes. With Swoopes at the helm, UT could throw Templin or a freshman that knows what to do out wide and get people open to the field but on the boundary the QB doesn’t matter unless the WR can make something happen. On a normal power run, the H-back/fullback has to kick out a defensive end and open a hole for the guard to pull through to find the middle linebacker. Texas’ H-backs aren’t particularly consistent at executing that block and the guards don’t always find people to block when they come over and find a mess at the point of attack. With this “power-read” concept, the offense leaves that troublesome defensive end unblocked and the QB has two options based on what he does with this freedom. If the end stays inside, then the QB hands off to the RB breaking outside who can run behind the H-back’s lead block on the nickel. These are favorable match-ups for most offenses and Gray+Beck/DLT/McNeal should wreak havoc in that setting. If the DE stays wide to contain the running back then the QB runs up the middle behind the double team and pulling guard’s block. Heard dominated with this scheme in high school and it’d be shocking if Swoopes couldn’t also figure out how to do real damage on a scheme that allowed him to plunge up the middle with his 6-foot-4, 250-pound frame. This is UT’s best bet for a running scheme that could work against the types of loaded boxes they’re likely to face and it will hopefully play a major role in the offense in 2015. 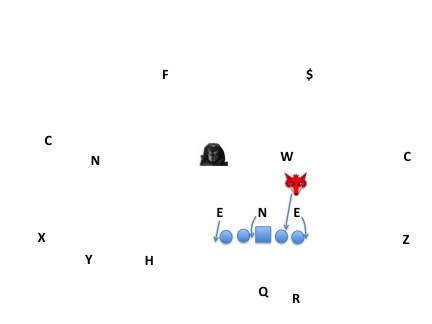 It’s also a good scheme for setting up play-action as the pulling guard often triggers linebackers and safeties to bite hard. Finally, if Texas can use its H-backs primarily for arc blocks or iso-blocks on linebackers rather than tangling with ends, that increases the chances of getting DeAndre McNeal on the field sooner than later. Sitting back in sound schemes and smothering an opponent’s favorite tactics is what you do when you have a veteran unit, when you have young, freakish athletes across the front you just attack people. 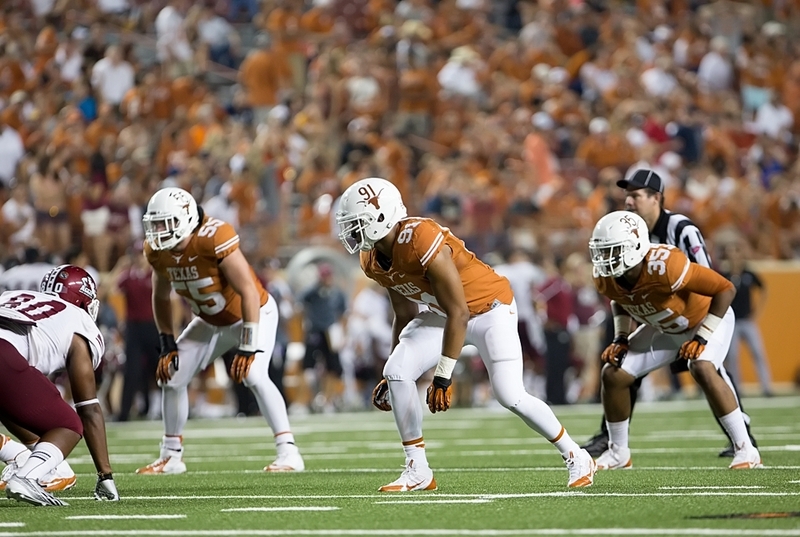 Texas’ 3-3 Under defense is designed to be able to attack opponents with just about everyone, but the Fox position has a unique name for a reason. This is the player that the staff will typically scheme to get into the hen house. By all accounts they really like what they have in Naashon Hughes and he’ll probably be the man there, especially when they play the 3-3 fronts where he can stunt or drop all over the field as opposed to the 4-2 fronts where he’s down in a stance across from an offensive tackle or tight end. When Texas does play the 4-2 fronts they may be more likely to utilize Bluiett (6-foot-4, 258) or Cottrell (6-foot-2, 253),who are stronger at the point of attack, over the leaner Hughes (6-foot-4, 232). Texas may not have a edge rusher in 2015 that forces opponents to game plan for them but what they could have in Hughes is a guy that can move around and target the soft spots in a given protection scheme and work in conjunction with blitzes from the nickel, safeties, and fellow backers Malik Jefferson and Ed Freeman. With athletes like Hassan Ridgeway and Poona Ford at 3-tech/4i-tech positions, DC Vance Bedford can rely on them to set the edge while stunting Hughes into interior gaps. He still needs to get more physical here but his ability to be an outside linebacker one snap, interior blitzer the next, and traditional edge player on 3rd down makes him much more dangerous. Besides the fact that he is the most credible dual-threat player of the various Fox candidates who can allow Vance to disguise blitzes, Hughes’ change of direction and wiggle make him the most effective blitzer of the various Fox players. He only had half a sack in 2014 but that number could be as high as seven or even 10 in 2015 if everything goes to plan. If Hughes has a strong year as a Fox, who is constantly disrupting opposing offenses, then many other pieces should fall into place. Texas is looking very good in terms of finding three cover players to free up the safeties and linebackers to load up the middle of the field with John Bonney emerging as a player that can play nickel or boundary corner as the case may be. The interesting storyline to monitor now, as Eric noted in his defensive corollary, will be whether Bonney is best utilized in the nickel package as the nickel or as the corner. Possible lineups include Bonney starting at corner with Antwuan Davis stepping in as a nickel or Bonney moving inside to allow Echols, Davis, or Kris Boyd to take over outside at corner. Given Strong’s words about ties going to freshman, Boyd seems like the best bet to be a de-facto starter in the nickel package. At safety Texas still needs for Jason Hall to find his early 2014 form, or for another player to step up at free safety who can be a physical presence in the box. This is perhaps one of the more concerning storyline of camp with DeShon Elliott already injured and future candidates for the spot such as Davante Davis, Kirk Johnson, and PJ Locke all a few years away from being intimidating as box safeties. With so many credible candidates fighting for spots at nickel or corner and Dylan Haines sitting on the back end and hawking opposing tendencies, Texas should have a lot of options for handling spread passing teams. However, finding adequate support for the young crop of linebackers against the league’s better run games is a major priority for the defensive staff this fall. There are fewer obvious answers here other than…the Diaz doctrine. The Diaz doctrine is to kill drives by inflicting negative plays via the zone blitz and surviving the occasions where the offense beats the blitz by being a good tackling team at all 11 positions. There’s good hope that 4.4 speed at middle linebacker, 4.6 speed at weakside linebacker, and a Charlie Strong practice regimen that emphasizes tackling to the ground will make this approach feasible. Again, you’d like for Hall to be back on form or another great tackler to be well established alongside Haines, but there’s good hope that an aggressive defensive strategy from Texas will be successful against most of the teams on the schedule. Particularly if Ridgeway is dominating in the middle and young players like Ford and Hughes make a leap. A difference making outside receiver: If teams are differing stress to their corners to pack the middle of the field, Texas needs to be able to make them pay for it by having a receiver that can go Iso on a corner. A willingness to run the QB: Texas could constrain the run game with Swoopes’ arm and RPO schemes but the staff is giving away a major advantage if they don’t make power-read and other QB run schemes a big part of the plan for 2015. Disruption from Naashon Hughes: As much as UT is putting on Malik by asking him to be a starting middle linebacker and foundational piece to the program, Texas needs disruption from the Fox in 2015 to make up for what was lost with Malcom Brown, Jordan Hicks, and Steve Edmond graduating. Steady tacklers on the back end: Texas has so many athletes at DB that it just doesn’t seem worthy worrying about whether they can find three strong coverage players but their approach to stopping the run will require finding guys on the back end that can track the ball and tackle. If Strong can check off those boxes this spring, he should be able to meet the quantifiable and unquantifiable goals for this season and keep this train rolling.